If you’ve ever wondered what the difference is between ice cream and gelato, then you’re not alone. Many people think that they’re exactly the same thing, and as an Italian I’m appalled! Whilst there isn’t a massive difference between the two, there are subtle differences which make the ice cream versus gelato argument quite interest. Which one is better for your waistband? And more importantly, which one tastes better? Well, I’ll have a look into that and cover what you need to know to differentiate between the two. These are the main points that you may notice a difference between ice cream and gelato. There aren’t many other differences between the two, and you likely won’t notice a difference unless you really love ice cream. Of course, usually you’d add things like fruit and chocolate in accordance to what flavor ice cream you are making. These are the staple ingredients of your gelato, though. Gelato will usually be slightly higher in carbohydrates than ice cream, but certainly not by a significant amount. The use of milk in gelato will give you a higher amount of carbs in your gelato. If you’re specifically looking to minimize the amount of carbohydrates in your gelato, you can always consider using an alternative to whole milk like soy milk. Specifically unsweetened soy milk, as this is particularly low in carbohydrates, which make it perfect for making a low carb gelato – important if you’re on a keto diet! This is the main area where ice cream and gelato tend to differ. Traditionally, ice cream is made with only heavy cream, whereas gelato is made with cream and milk. This makes gelato slightly lower in fat that ice cream. I have seen a lot of gelato recipes that tend not to use milk; this isn’t gelato! You’re just making ice cream. Ask any Italian and they’ll tell you that a good gelato uses a good amount of whole milk (3.5% milk is best in my opinion) in proportion to the amount of cream that you’re going to use. An approximate amount to use is double the milk to the amount of cream that you’re going to use. For example, if you have a recipe with one cup of cream, use two cups of whole milk. Again, gelato uses whole milk which has a relatively high protein content in relation to ice cream. This makes it slightly higher on protein, but not by too much. The difference in protein will usually rely in your ice cream or gelato toppings, too. For example, if you have an ice cream that’s topped with nuts, then this is going to increase the protein content of your dessert. You can also consider using a small amount of whey protein in your ice cream/gelato if this if you would like to increase the protein content of the dessert. Both gelato and ice cream are fine as part of a regular, balanced diet. They use similar ingredients, but in my experience, I prefer to eat gelato when I am dieting. This is because I can use low calorie milk and less eggs in my gelato, which reduces the amount of fat significantly. In all honesty, you probably won’t notice much difference between the two if you limit the amount of dessert you’re eating. It doesn’t really matter which you eat; if you eat too much of it, you’re going to gain weight. To get the best gelato, you’ll have to serve it slightly warmer than what you would serve an ice cream. Not by much, but this is pretty noticeable and will definitely affect the taste difference between the two. You’ll also likely notice that a gelato has a far more intense flavour than an ice cream because of the way that it’s churned. Not only this, but stereotypically Italians are more likely to use a richer and intense flavor for a gelato than they would with an ice cream. Flavors like pistachio work better as a gelato because you can make them taste richer than you can with an ice cream. The difference in texture is, in my opinion, the biggest difference between ice cream and gelato. Because of the way that gelato is made, you’ll definitely notice that it feels a lot denser in your mouth. This is mainly because of the milk that’s used in gelato, but also because of the slower churning process that is used when making gelato. I always say that it’s a lot easier to make gelato in your home ice cream maker, because you don’t have to churn it as fast as you would with ice cream. 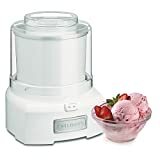 Proper ice cream machines are more suited to making ice cream because they have the ability to churn the ice cream much faster than you can with a smaller ice cream maker that you’re using at home. With both ice cream and gelato, it’s important to ensure that you’re churning the ice cream properly to get a good consistency. Whilst ice cream and gelato both use similar flavors, there are a few differences which can make a difference. For example, fruit is an extremely popular option in both ice cream and gelato. Strawberry, Raspberry.. both very popular. But, usually gelato can use puree which give it a more intense flavor than ice cream. That’s why if I’m going to pick a flavor like raspberry, I prefer to go for a gelato as it’s stronger on the tastebuds. Another really big difference that you might notice with gelato, especially if you’re visiting Italy, is that they are more likely to use spices and herbs. This is either as decoration, or actually part of the ingredients of the gelato. Not only spices and herbs, but stronger flavors like liquorice are actually extremely popular choices for a homemade gelato (it’s not my personal taste, but hey ho!). Avoiding allergies is like avoiding a minefield when you’re eating ice cream and gelato. It’s important to know what the ingredients are of your chosen dessert to make sure that there’s nothing in there that you’re allergic to. It’s pretty obvious that both gelato and ice cream are not suitable for someone allergic to dairy. They use cream and milk as the primary ingredient, so unfortunately you’ll need to avoid traditional ice cream if you’re lactose intolerant. Not all hope is lost, however; if you are allergic to lactose, then you can always find a dairy free alternative ice cream that uses soy milk or coconut milk, or you can opt for a delicious sorbet as an alternative (sorbets only use fruit, so you don’t need to worry about the inclusion of milk). Another big one that might affect your allergies is nuts. Both ice cream and gelatos use a lot of nuts in certain flavors; pistachios and hazelnuts are some of my favorites. For this reason, it’s important to check the ingredients of any ice cream that you’re going to order. If you’re in the US, then the most popular brand of gelato is undoubtedly Talenti. Talenti is a good option if you’re looking for a delicious gelato that is much thicker than what you might be used to with regular ice cream. It’s undoubtedly my favorite gelato brand in the United States. If you’re going for ice cream, then in my opinion you can never go wrong with Breyers. I know, I know.. everyone loves Ben & Jerry’s and Dairy Queen, and they’re okay too. But I prefer Breyers as they tend to be higher quality, which is something that I look for in my ice cream. Plus, Breyers tend to be quite a bit lower in calories than B & J, which means I can eat more of it! To sum it up, there aren’t many difference between the two and you likely will not notice this unless you eat a heck of a lot of ice cream. Personally, I’ll always opt for a good gelato when possible as I prefer it, bue it is subjective to what you are looking for in an ice cream. If you’re wondering what the differences are between the two, which is better for your diet and how to tell a good sorbet from an ice cream, then you’re in the right place. One of the more common things that I’m asked is what the difference is between ice cream and sorbet. To me, that’s kind of ludicrous; it’s easy! Here, I’ll give you a quick round up of what the main differences are, then we’ll dig a little deeper into telling the difference between the two. Traditionally available in far more flavors than sorbet as sorbet typically comes in fruit flavors only, although you can find chocolate sorbet too. These are the main points that you may notice a difference between ice cream and gelato. You’ll also notice that you don’t need an ice cream maker for making sorbet, whereas you do with ice cream. There aren’t many other differences between the two, and you likely won’t notice a difference unless you really love ice cream. This is the area where ice cream and sorbet truly differ. Whilst they are made in a similar fashion and some people mistake ice cream for sorbet and vice versa, they really couldn’t be further from each other in this sense. And that’s it! Really. This is why sorbets have become extremely popular to make at home, due to how easy it really is to make them. You only need a couple of ingredients and you can make yourself a delicious sorbet from home. Sorbet is pretty much all carbs. Not just carbs, but carbs that sugar. This makes sorbet an extremely bad choice if you’re an sort of low carb or ketogenic diet. The high amount of carbs in sorbet make it almost impossible to stay under the daily carb allowance on these diets. Certain ice creams however, can be part of a low carbohydrate diet – especially if you find one that is low carb friendly. Just because there are a lot of carbohydrates in sorbet, doesn’t mean that you can enjoy it as part of a balanced diet. Just make sure you continue to exercise and you’ll be able to work off the carbohydrates that you are eating. A really good sorbet will have minimal fat content. This is because of the ingredients that are used in it, as it really only contains sugars. This is good if you are looking to go on a low calorie diet, where high carbohydrates and low calories are usually what is accepted. Carbohydrates only have 4 calories per gram, so you can afford to eat a lot more carbohydrates than you can eat fats and alcohols. Ice cream will have much more fat than a sorbet, which will usually mean that it is much higher per calories than a sorbet. There is minimal protein in sorbet, so it’s not a great choice if you’re looking to include more protein in your diet. One trick that I like to use is to scoop a small amount of whey protein into my sorbet, as this can increase the protein content of your food significantly. Ice cream also has minimal protein, which is why it’s usually avoided by bodybuilders and fitness enthusiasts. Again, a great trick is to mix a scoop of whey with your ice cream to increase the protein content. Unless you’re on a low carbohydrate diet, then sorbet is undoubtedly better for you when you’re on a diet. This is because it’s quite significantly lower in calories than ice cream, as it only uses fruits and sugars which do not contain high amounts of calories. For the healthiest sorbets, you could even look to using a homemade recipe which limits the amount of added sugar. Here’s a great example of a healthy sorbet which limits the amount of added sugars. Sorbet is usually much more tart than ice cream due to the ingredients that are used to make it. A general rule is that the less sugar that is used in the sorbet, the more tart that it will taste. This is because sugar will usually make things sweeter and less sour. This makes sorbet ideal for citrus flavors like lemon, as it allows the sour flavour to come through. The texture of sorbet is undoubtedly much coarser than what you would usually have with an ice cream. This means that a sorbet will have a much higher density, which is great if you prefer a more textured dessert. Just because sorbet is coarser than ice cream, this doesn’t mean that it is necessarily of a stronger taste – though this is usually the case. The reason that sorbet usually tastes much stronger than ice cream is because it is primarily made up of pureed fruits, which give it a tart taste that won’t be favorable to many. Sorbet is still considered an acquired taste. Ice cream undoubtedly has a much wider array of flavors than a sorbet. Generally, you’ll only find fruity sorbet flavors as it’s made with fruit puree and not with cream and the ingredients that ice cream is made with. You can find chocolate sorbets, though this is a rarity and not traditionally the norm. Sorbets are absolutely fantastic if you have allergies to some of the ingredients in other desserts. Any top restaurant will always have some sort of sorbet on the menu to cater for those with allergies, like celiacs or lactose intolerant. This is because sorbets generally only contain three ingredients; water, sugar and fruits! Unless you have a fruit or sugar allergy, you’re not going to have any issues with eating sorbet. Ice cream however, is not ideal for those with allergies. There’s actually a huge amount of people who have a lactose intolerance without knowing it. If you think this might be you, exclude lactose from your diet for a week and see how you feel!. My favorite sorbet in the United States is, and always will be, Ciao Bella. I love the taste of it, and find that it’s the most similar to what you would find in an Italian town or city. If you’re looking for a nice ice cream, then I’d recommend Breyers as my favorite brand of ice cream. I know, I know.. you love Ben & Jerry’s. But in my opinion, Breyers make some of the highest quality ice creams around. If you’re looking to make your own sorbet, I thought I’d better round up some of my favorite options. To conclude, I don’t think there is too much difference between a good sorbet and a good ice cream. You will easily be able to tell the difference (taste, texture) but they both provide the same thing – a delicious cooling dessert for the summer months.